ASUS' Zenbook Prime is due for its official launch later this month. As we found in our early review of the UX21A, ASUS addressed nearly every problem we had with the original Zenbook. While Ultrabooks won't really get super exciting until Haswell, if you've been holding out for a non-Apple ultraportable, the Zenbook Prime is likely just what you've been waiting for. My only major concern about the Prime is its Sandisk U100 SSD, which simply isn't very good - particularly compared to what Apple is expected to be shipping in the next MacBook Air. I've shared my test data with ASUS with hopes that we may see the return of another SSD option for the Zenbook Prime prior to launch, but it's too early to tell if that will happen. I have been running additional battery life tests on the Zenbook Prime, but I didn't get a chance to finish them before hopping on a plane to Taiwan for this year's Computex. I did get the chance to dissect the new Prime however. Getting into the new Zenbook is no different than its predecessor. Ten torx bits keep the back panel on, while only four phillips screws hold the motherboard in place. Another five keep the battery secure as well. 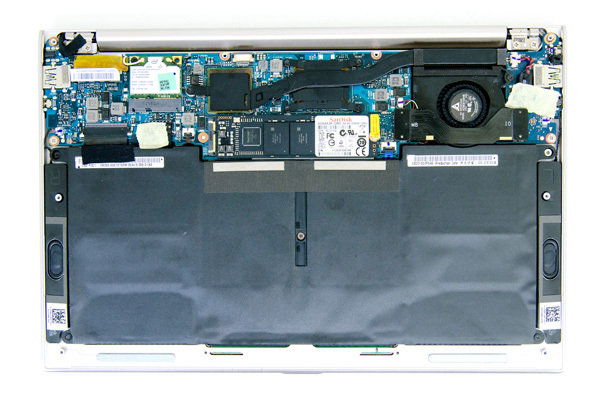 Despite the only easily removable component in the Zenbook Prime being the SSD, the notebook is remarkably simple to teardown as long as you have the right screwdrivers (the same drivers that work on the MacBook Air work on the Zenbook Prime). Internally the Zenbook Prime is very similar to the original Zenbook, and Apple's MacBook Air at that. The majority of the volume of the chassis is occupied by the 35Wh battery. The CPU and PCH are cooled by a single fan and heatpipe assembly. With Haswell the CPU and PCH will be integrated into a single chip (just for Ultrabooks), which should help further reduce the motherboard size. Eventually I wouldn't be too surprised if we could fit a high performance x86 motherboard onto a PCB not much larger than what Apple ships in the iPad. 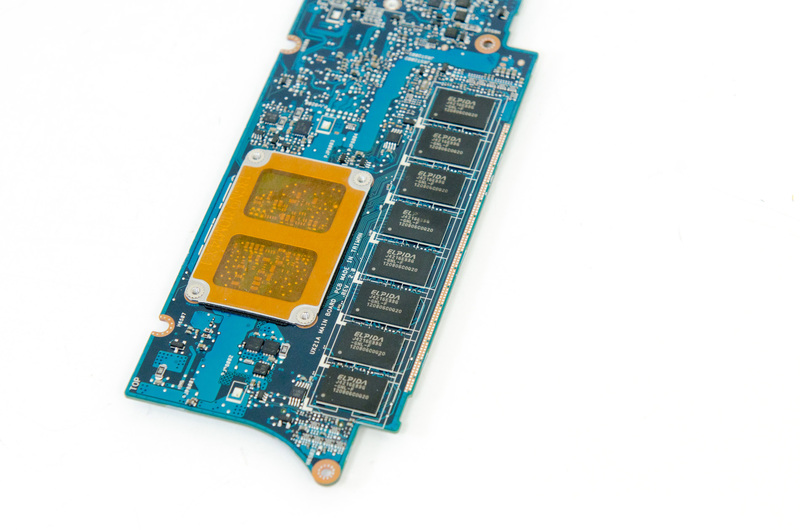 ASUS still employs a split PCB design for the Zenbook Prime. The second USB 3.0 port and audio jack are on a separate PCB that connects via a ribbon cable to the main board. The SSD is a custom interface and form factor that isn't compatible with Apple's MacBook Air, although the two look similar. A single phillips screw holds the SSD in place. You can see the two antenna pigtails for the Intel Centrino Advanced-N 6235 2x2:2 WiFi solution, an improvement over the previous model. The only thing of interest on the flip side of the motherboard is the 4GB of non-removable Elpida DDR3-1600. ASUS is testing 8GB today but it's unclear when that will make it to market - it could be as long as the Haswell version next year. Is there room for improvement? Not without significant silicon integration I'm afraid. The Zenbook Prime's motherboard today is about as compact as you can get given currently available components. We'll see the next big step with Haswell (single-chip CPU + PCH), but eventually you can expect even more on-board integration. An obvious candidate is to solder down the SSD and reduce the number of NAND packages. That's unfortunately the tradeoff of portability: an appliance that really can't be upgraded. There is some hope with high-bandwidth interfaces like Thunderbolt however to give you more storage, and perhaps even PCIe expansion outside of these ultra portable PCs. I'm always a fan of having the best of both worlds. "The SSD is a custom interface and form factor"
As always, thanks Anand for the great post. Tell ASUS to ship the 8GB model. I'd buy it. In future teardowns, can you note the type of battery specified for each ultrabook? I am asking because integrated batteries are difficult/expensive to replace, and some manufacturers are specifying 1000-cycle batteries (against the typical 300-cycle). Apple began the trend with the Macbook Pro, I think, but I don't see them touting it anymore. Dell Latitude ST has a special "Long-life" battery inside. Samsung Series 9 Tablet makes 1000-cycle battery a selling point in marketing material. Do Asus and Acer use better batteries, or are they scraping by (again) with cheaper look-alike alternatives? (and to think Asus pushing their proprietary SSD interface is just laughable). And what's inside the Z830, if/when you review the Ivy Bridge version? The news on the SSD is a bit disappointing, though I'm guessing won't make a huge difference for everyday use? I prefer the UX32VD Series because of the swapable HDD and RAM.